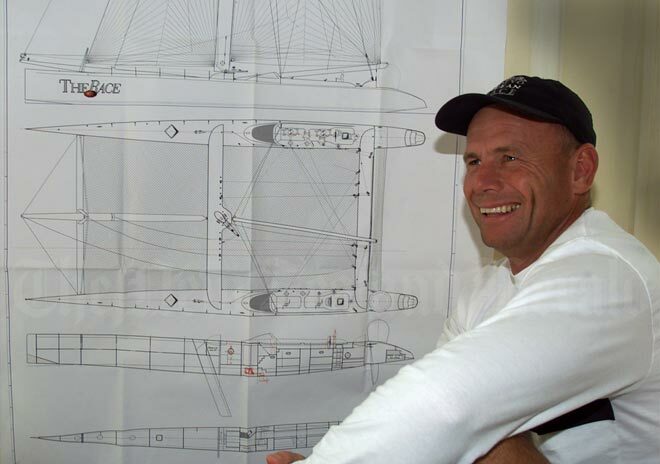 After decades sailing single-hulled yachts, in 2000 New Zealand skipper Grant Dalton began sailing large catamarans non-stop around the world. He is shown here with drawings for Club Med, the design of which was derived from that of the Polynesian double-hulled canoes. Early European explorers such as James Cook were convinced that the Pacific was peopled through purposeful voyaging. They had witnessed the speed and agility of ocean-going double-hulled and outrigger canoes, both of which made European ships look slow and lumbering. Cook had reported that double-hulled vessels were ‘fit for distant navigation’.